People who own dogs are used to playing catch. And almost anyone who’s ever taken her dog to the park has probably played with a Frisbee or other flying object that the dog is supposed to retrieve and bring back. Dogs love this game. You can make your games of fetch even more fun by choosing the right toys. Dogs often have toys that are hard and rubbery that are good for them to chew on. These toys help remove tartar and promote good dental health. But when a hard toy isn’t meant for healthy chewing, there can be problems. This is especially true if your dog likes to jump and try to catch the toy in the air. A hard plastic Frisbee or disc toy could hurt his mouth or teeth if he grabs it while it’s flying, or even if he bites down on it while it’s motionless. Soft toys like EzyDog’s flying toys won’t hurt your pup if he grabs them out of the air. The soft construction eliminates this risk and makes it extra safe for you to play fetch with your dog however you like best. The flying disk soft toy is not only designed to be easy on a dog’s mouth and teeth, but it can help prevent them from hurting their mouth and teeth while trying to pick it up from the ground. The softness helps with this, but the design also makes it easy to grab. Instead of a flat toy, the disk has four soft points and a concave shape. That means the edges are up off the ground, so the dog doesn’t even have to touch the ground to grab it. 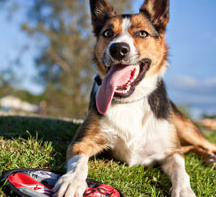 Less frustration and less risk of mouth or tooth injury means you can have more fun playing fetch with your dog. While it might seem like a small point, there’s also another advantage to soft, pliable dog toys. If you’re headed out for a day of play, it can be easier to stuff a soft toy into your purse, backpack or other bag than a rigid one. A plastic disc can’t be folded or made to fit into a container smaller than it is. EzyDog’s soft toys can be more easily stuffed into a bag and tossed here or there without worry about the hardness or the size. They won’t get brittle in the cold like a plastic toy can, either, which can make it more liable to crack or break. These soft toys are not meant as chew toys, so they shouldn’t be left out for your dog when he’s unsupervised. But they’re the perfect dog toys for you and your pup to enjoy a day of play.